Four years ago, Dejah Hall was ready to end her life with three pounds of heroin. Today, she has a new full-time job helping those who used to be her — and that’s in addition to being a mother, a sophomore online student at Grand Canyon University and an inspiration to others. Dejah Hall’s life was changed — for the better — when she was arrested in 2012. 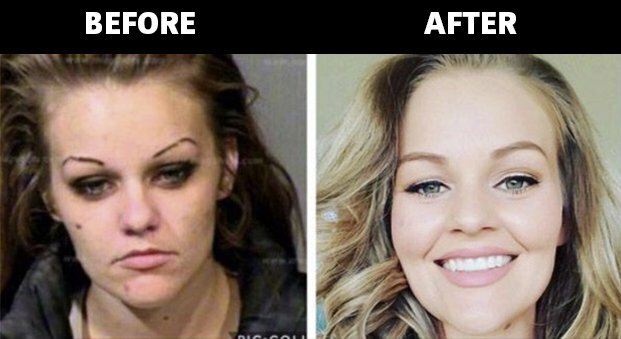 A simple before-and-after social media post to commemorate Hall’s four-year “anniversary” date of sobriety helped push her life story of transgressions and transformation viral. Hall can’t keep up. Phone calls are lagging and she’s behind in responding to hundreds of messages received, even with a Facebook page solely dedicated to her journey. 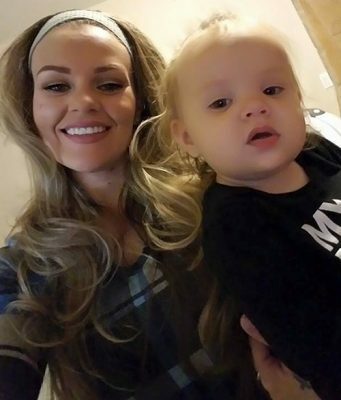 The 26-year-old is raising her 18-month-old daughter, Lydia, just began her new position as a peer specialist at Community Bridges and is two years away from her bachelor’s degree in Christian Studies at GCU. Tens of thousands of reactions later, she’s dizzy from attention and energized by the outreach. It’s the kind of hope she never felt as a teenager, when she began using prescription drugs. 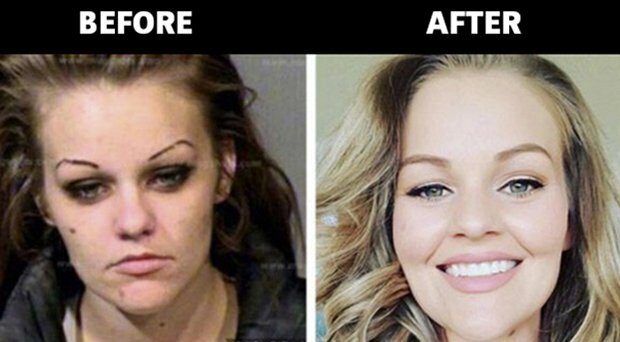 And it’s a far cry from what she felt when she was 22 and her $200-per-day heroin habit had progressed into crystal meth. On Dec. 6, 2012, Hall visited her grandfather on his 91st birthday, and he told her some painful truths of what had happened to their once tight-knit relationship. She went to the bathroom and cried. Hall and her 18-month-old daughter, Lydia. Instead, she was saved two hours later by, of all things, her own arrest: It was this lifetime atheist’s sign from above. “There was no other explanation or reason,” she said. “It was God. It was the only way to be saved from the imminent hell I was in. 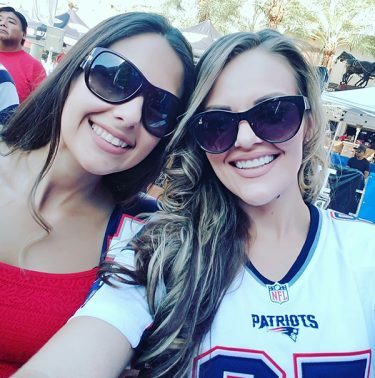 Two weeks after that fateful visit with her grandfather, after being convicted on felony charges of purchasing and possessing narcotics, she began serving her 2½-year prison sentence — on the very same morning her grandfather passed away. Her time was spent learning Christianity, the Bible and doing prayer circles in the prison yards. Hall’s sister Andrea Jones (left) said she always has looked up to Dejah. A prison pastor gave Hall information about GCU and other universities, but she was turned away by others because of her background and because she had only a GED. A friend from childhood who earned his degree from GCU recommended applying there. “God pulled me through to this, and He can do it for other people,” Hall said. But before she can worry about the long-term plan of earning a master’s in psychology or in a seminary, this wild road of Hall’s life journey from points A to Z first needs to reach point B. 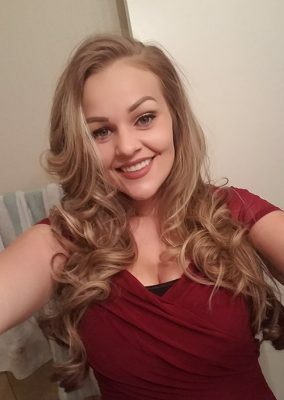 After Hall lost her car and house in the aftermath of her arrest and prison time, Jones recently started a GoFundMe page to raise $2,000 toward a car for her older sister to get to work and transport Lydia. Hall plans to spend the rest of her life giving back, an outlook that makes for many happy new years ahead. Just when you feel all hope is lost someone comes along to show you to never give up. As a father of a daughter who is living the destructive life style of addiction it is a daily struggle to maintain your hope when there is nothing you can do to help. I have custody of my two grandchildren one 3 and the other of 18 months. I pray each and everyday for them and my daughter who is slowly fading away. Remarkably awesome. GCU does not turn anyone away. I am currently attending, and have four more classes until graduation. I am so proud of you Ms. Hall. God saved you for His purpose. Go on and do His Will. Praying Gods continued blessings, strength and love will always be a part of you. In Jesus name. Amen. I love you??? She looks so beautiful! Absolutely gorgeous . A complete transformation.This is amazing inspiring and touched my heart tremendously. ? Reading this has motivated me to always keep striving forward and let nothing stop me. She is strong brave and an overcomer. Very courageous. Nothing can keep her down, she’s been through the worst and deserves the best that life has to offer. This just goes to show that nothing is too hard for God and nothing to difficult for him. He is able and willing to move in our lives if we seek him. I pray God continues to work in her life protect her and bless her. I love GCU and I’m glad that I’m attending this school I couldn’t imagine being anyone else. God truly led me here. Just like he led Deja. God is within her and she will not fall. I pray blessings over her life and that continues striving towards greatness for herself and her baby Lydia. God has used her experiences to bless and encourage millions. I’m so glad I read this!! God bless this woman!!!! Our Might Creator is absolutely amazing!!! I have a similar story with drug abuse and a felony conviction, abuse and three little kids all along for the ride. The Lord removed me and my children from that life and built me back from the ground up. I was so blessed to be able to walk across the GCU stage last April!! One of the best feelings because I dropped out of high school so I never got to experience a graduation until then. The Lord put a calling in my heart and I am on my way! It’s amazing what one can accomplish when you put your faith into the Lord!!! Great story and transformation. Thanks for sharing. I am so happy for you and your beautiful baby girl. I am also a sophomore at GCU and I love it!!! Stay strong and remember that with God anything is possible. Dejah Hall, I read your story, and by looking at your pictures from before and after God has done so much for you and saved your life. Keep it up. Eerything is possible with God and Grand Canyon University. I am very proud of you. After reading this story about you Ms. Hall, there is no need for me to have a pity party. At the age of 51, I have decided to go back to school and I am now attending GCU online. When I took my math class I became so angry, frustrated and full of anxiety that I did not pass the class and was convincing myself that school was not for me, especially at my age. I have decided that, yes, school is for me and I am at the right place to fulfill my educational journey. I have Faith that God put me here for a reason and you Ms. Hall are my “WHY”. If you can do it, so can I. Thank you for giving me a good whooping right now and reminding me that it is God that is in control and if we continue to fulfill His dream He surely will provide us (believers) and make a way for our dream. Good luck, congratulations and I can not wait to read your story more in depth as an autobiography. God is REAL!! He is a god of second chances. He said to have faith the size of a mustard seed… Bless you and your family. May God continue to strengthen, protect and guide you. Amen. GCU is awesome. I complete my BSN in May! Hello Deja what a amazing story and what a cute daughter you have. I have a son, but hes 21. It’s hard to believe hes going to be 22 years old this year. You have such a wonderful testimony of healing and faith. May God Bless You Always! I know God has the best interest for me and I will see it unfold in His timing. I have a wonderful testimony too! I had Aids and suffered for many years with this sickness. Jesus Saved me one year earlier before I found out I had the Aids virus. Jesus has healed my Aids and now Im in the hiv stage. I am currently an author of the book Tears to Joy finding God’s Love Through the Heartache by Mollie Patterson. God has done some wonderful miracles in my life. I am in my 2nd year at GCU and getting my Bachelor in Communications. I cant wait to see what god has in store for me this year! Such a wonderful example of how God works! Thanks for sharing your story and being an inspiration to many. Your testimony gives hope and shows that all things are possible with Christ. For those experiencing addiction and the families that feel helpless watching their loved ones on this path, I believe it’s clear to see that we should never stop praying or lose hope. It’s wonderful to see how He has turned your life around. Best wishes to you as you pursue your career. Thank God for great colleges like GCU and the opportunity they give to others in helping us achieve all we can be.